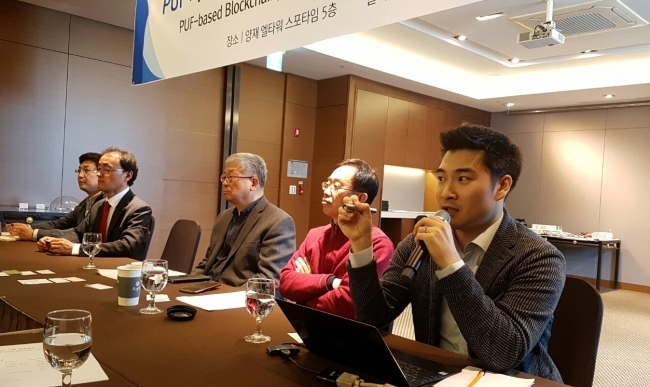 South Korea‘s research team unveiled Thursday it has developed a ledger-free blockchain system that runs on inter-device communication system featuring enhanced security, designed to tackle consumer inconvenience on existing blockchain platforms that stems from consensus delay and slow transaction speed. The homegrown system, dubbed “PureChain,” will have an inter-node transaction go through both external confirmation between nodes, or those engaging in the transaction, as well as internal confirmation within a node, divided into two areas -- secure area and user confirmation area. The transactions can be made both online and offline, according to a Thursday announcement by a team built on industry-academia collaboration. The process on the ledger-free decentralized platform will help avoid a double payment of the same invoice on the digital system, while at the same time allows a transaction to complete through consensus without a third-party intervention. Multi-party transactions could also be made on the system. PureChain can also be used for user verification, the team added. The new decentralized platform will be based on a technology called physical unclonable function that features in semiconductor chips embeddedd in Internet of Things devices. Transactions could be made through representations of money, including existing coins or tokens encrypted on other blockchain platforms. The team expected the representations of money to be applied in digital currencies released by central banks, and ultimately replace the existing fiat money, or currencies like US dollar or the Korean won. The development of decentralized digital infrastructure marked a step forward for ICTK, leading the team. ICTK is a Korean software company that enabled a mass production of PUF products since 2016 by partnering with local manufacturers including Samsung Electronics. Along with ICTK, the team consists of blockchain tech company epitomeCL, as well as two academic researcher groups led by Han Dong-soo, professor at Korea Advanced Institute of Science and Technology, and Han Ho-hyeorn, professor at Kyung Hee University, respectively. The team could develop into a consortium, joined by more information technology firms, blockchain firms, financial companies, among others, according to the team.